As you can see, this assortment contains chocolates that were previously nonexistent in vegan form, and they taste even better than they sound. This magnificent sampler is just so delicious, we won’t be surprised if you eat the whole box in one sitting! Available in Dark Or "Milk" Chocolate varieties. $11.99 each. From Mistree Durham of Yuma, Arizona on 10/13/2015 . I can't even fathom how one of these reviewers could dislike these chocolates. I've tried both the dark and the milk variety, they're both outstanding. There is no reason to miss or even compare dairy chocolates to these. The flavors are traditional and also artful. 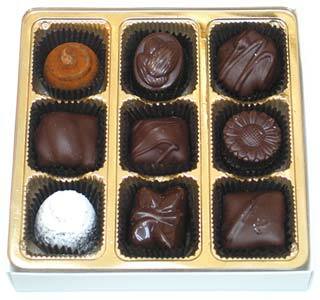 Even before becoming a vegan I had never had such a delicious assortment of chocolates. My dark chocolate box had the Gianduja and the Amadine and oh my gosh they are spectacular. They have such decadent, creamy, tasteful fillings. I'm going to order another box of each! I don't even care if i'm a chubby bunny for it! From Christina Branum of Lincoln, Nebraska on 2/15/2015 . I was really looking forward to these "Milk" Chocolate ones but these were pretty bland. Most of them had the same caramel or nutty filling. Wasn't worth the money. From Jennifer Esposito of Woodstock Valley, Connecticut on 2/4/2015 . Purchased a box of the milk chocolate as a gift for myself last December. From Jennifer of Durham, North Carolina on 4/25/2014 . I got the "milk" chocolate ones and they were wonderful. The only vegan chocolates I find locally are dark chocolate so this was a nice change. My non-vegan boyfriend loved them too. From Anonymous of Cape Cod, Massachusetts on 12/26/2004 . My milk-consuming family love these too!!! Rich and chocolatey!! !